Each Thursday afternoon children in the Naas area gather at Kids Klub, an after-school activity time. Kids Klub Naas has been entertaining children in the area on Thursday afternoons since 1998. It began with a dozen children in a back garden in Jigginstown, but quickly expanded as word spread. Now Kids Klub meets in the sports hall of the Naas Sports Centre (next to K-Leisure) in Naas. The entire complex is located off of the New Caragh Road, between the Newbridge Road and the Ring Road. Kids Klub meets every Thursday afternoon from 16.30 to 17.30. Kids Klub follows the school term so when there is no school, there is no Kids Klub. Feel free to ring Roger & Mary on (045) 894 771 with any more questions you may have. We operate a Child Protection Policy and our workers are Garda vetted. 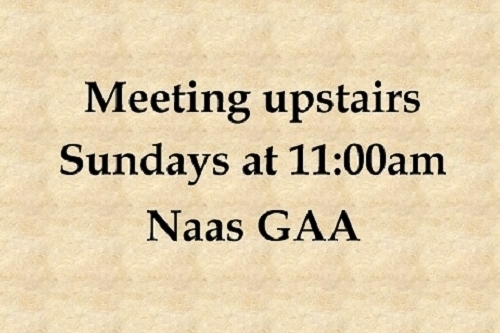 We meet upstairs in the Naas GAA on Sunday mornings beginning around the Lord's Table at 10.30 before our main service begins at 11.00. It's a joyful time of singing, scripture reading, prayer, praise, and sharing from the Bible. If you have babies or young children, we make provision to care for them during the main service. Come early or stay after to enjoy tea & biscuits. On Sunday evenings at 18.30, we come together again for Bible study, and children attend Sunday School at our pastor's home in Naas. Small Bible study & prayer groups meet throughout the month at various locations across northern Co. Kildare. If you are interested in sending your children to Sunday School or attending a small group meeting yourself, please send us a message via the about us page. Our events all run under the supervision of multiple Garda vetted adults.